Yesterday, I made my favorite everyday banana bread, a low-fat, lightly sweetened version that uses plenty of whole grains. Today’s version is basically the complete opposite: all white flour, plenty of butter, lots of sugar, even a block of cream cheese. Oh, and just in case there wasn’t enough going on, there’s four different and wholly unneccessary toppings you can choose between. There’s absolutely no call for that much going on in something calling itself “bread”. In fact, it’s probably more apt to call it “banana cake” instead. But oh man, is it good! If I need to win someone over, I know I can give a loaf of this bread, and they’re putty in my hands. Putty, I tells ya. This bread is a rare treat, but for those times where I simply need the absolutely best-tasting quick bread in the world, this is the one I reach for. When I make this recipe, though, I usually reduce the sugar and add a pinch of cinnamon (banana bread just needs cinnamon!). Both these changes are shown in the recipe below. Yes, that is the reduced amount of sugar. I’ve made the batter into muffins this time, mostly because my loaf pans were all otherwise in use. This bread makes fabulous muffins, since the batter is so full of hygroscopic sugar and moisture-lending butter, there’s no way they’ll ever dry out. Additionally, I’ve chosen to show them just plain, as a sort of blank canvas for your imagination, but I highly recommend trying one of the toppings. The four topping variations shown below the recipe are each just as delicious and lily-gilding as the next, so I’ve elected to leave them as they were originally written. I thought about leaving them out, in the interest of not trampling on anyone’s copyright, but I just didn’t have the heart. It wouldn’t be the same! So forgiveness, please! I originally came by this recipe from my mother’s very good friend, Mrs. Frances, who found it in Southern Living some years ago. As I recall, she brought us a loaf of it, swearing up and down that it was the best banana bread recipe she’d ever tried. The smell alone might have convinced us; but one bite, and we were begging her for the recipe. She happily obliged, and the rest is history. In our family, anyway. This is one of those recipes that gets fondly reminisced over. On occasion, someone will say, “Do you remember that banana bread Mrs. Frances brought us that time? That one with cream cheese?” Eyes wide and rolling upwards, we nod, an involuntary “Mmmm” escaping our spreading smiles. Someone may furrow a brow, prompting further explanation: “You remember, it had some sort of orange glaze on it?” Memory triggered, we all agree that we should make it sometime. But we never do; there’s always something a little healthier that we should have instead. There’s always something a little less fussy to whip up, or the bananas aren’t quite ripe enough. There’s always something. And with a thing that makes us all smile so much, a thing that evokes such fondness in each of our minds, isn’t that a shame, to relegate it to obscure memory only? So here’s to throwing caution to the wind on occasion. Here’s to the most cake-like, ridiculous, over-the-top banana bread I’ve ever seen, and the four nearly-senseless toppings that go with it. It’s fattening and sugary and can hardly be called bread at all; but once in a great while, you should bake something ludicrous just like this. Make enough to share with everyone, though; you’ll definitely want to have someone to join you in reminiscing about it. 1. Preheat the oven to 350° F, and position a rack in the middle. Grease and flour two 8 x 4 inch loaf pans, knocking around to remove excess. Alternatively, line 24 standard muffin cups with paper liners. Set aside. 2. Using an electric mixer fitted with the paddle attachment, beat the butter and cream cheese at medium speed until smooth and creamy. Gradually add sugar, beating until light and fluffy. Add eggs one at a time, beating just until blended after each addition. 3. Whisk together the flour and next 4 ingredients. Slowly add to butter mixture, beating at low speed just until blended. Stir in bananas and vanilla. Spoon batter evenly into the prepared loaf pans or muffin cups, and lightly smooth the tops. 4. Bake at 350° F, 1 hour for loaves or 25 minutes for muffins, or until golden brown and a skewer inserted into the center comes out clean. You may need to shield loaves with aluminum foil during the last 15 minutes of baking to prevent over-browning. Cool bread in the pans for about 10 minutes before removing to a wire rack to cool further before slicing. Prepare bread batter as directed, and spoon into desired pans. Sprinkle 1 cup coarsely chopped, toasted pecans evenly over batter in pans. Bake as directed. Cool bread or muffins in pans 10 minutes; remove from pans to wire racks. Stir together 1 cup powdered sugar, 3 tablespoons fresh orange juice, and 1 teaspoon grated orange rind until blended. Drizzle evenly over warm bread or muffins, and cool 30 minutes on wire racks. Prepare and bake bread or muffins in desired pans. While bread is baking, stir together 1/4 cup butter, 1/4 cup granulated sugar, 1/4 cup firmly packed brown sugar, and 1/4 cup milk in a small saucepan over medium-high heat; bring to a boil, stirring constantly. Remove from heat. Stir in 1 cup sweetened flaked coconut; 1 cup chopped, toasted pecans; and 2 teaspoons vanilla extract. 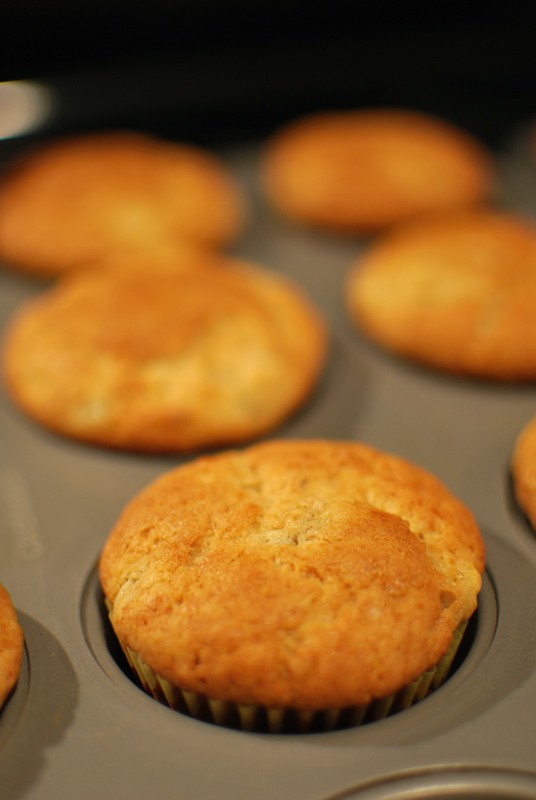 Remove baked bread or muffins from oven, and immediately spread tops with coconut mixture. Broil 5 1/2 inches from heat 2 to 3 minutes or just until topping starts to lightly brown. Cool in pans on wire racks 20 minutes. Remove from pans, and cool 30 minutes on wire racks before slicing. Prepare bread batter as directed, and spoon into desired pans. Stir together 1/2 cup firmly packed brown sugar; 1/2 cup chopped, toasted pecans; 1 tablespoon all-purpose flour; 1 tablespoon melted butter; and 1/8 teaspoon ground cinnamon. Sprinkle mixture evenly over batter. Bake and cool as directed. Prepare bread batter as directed, and spoon into desired pans. Combine 1/2 cup plus 1 tablespoon all-purpose flour and 1/2 cup firmly packed brown sugar in a small bowl. Cut in 1/4 cup butter and 3 tablespoons creamy peanut butter with a pastry blender or fork until mixture resembles small peas. Sprinkle mixture evenly over batter in pans. Bake and cool as directed. 1. If you like, you can add 1 cup of toasted and chopped pecans or walnuts (or a mixture) to the batter. It lends a great texture, but isn’t exactly necessary.